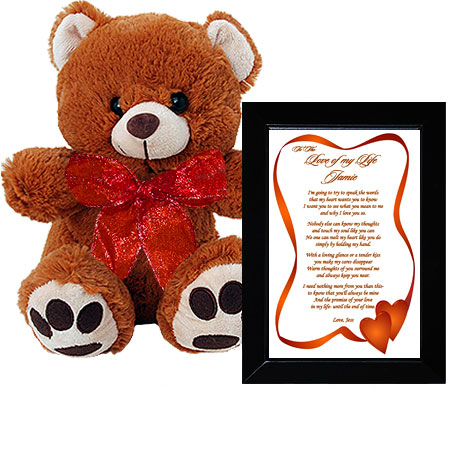 The teddy bear and the personalized poem presented in a modern black frame will melt his or her heart. The charming love poem is presented in a red heart design accompanied by an adorable plush teddy bear sporting a red bow. Perfect personalized gift for your love. Special gift for a birthday or an anniversary. Will put a smile on his or her face! and why I love you so. simply by holding my hand. and always keep you near. 4.7 out of 5, Based on 4 Reviews. Gift for my wife. She loved reading the poem and brought the frame to work to put on her desk. 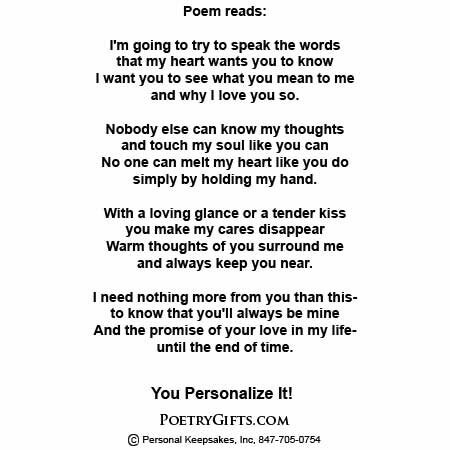 My boyfriend loved the poem personalized with his name and i loved the bear!